Are you publishing on LinkedIn? Is your content getting the shares it deserves? Publishing your articles on LinkedIn helps build your personal reputation and increase exposure for your business or website. In this article I’ll share four tactics for publishing content that gets read and shared. The best day to publish on LinkedIn appears to be Tuesday, with Monday as a close second. Shares decline as the week progresses and by the weekend, shares are at their lowest. Tuesday is the best day to publish your content. 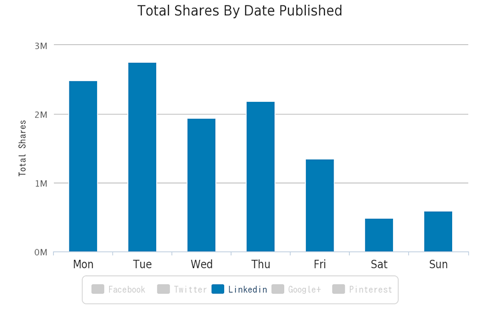 The chart above shows the total LinkedIn shares of articles published for each day of the week. As you’re planning when to share your articles on LinkedIn, keep in mind when most people are likely to see it. LinkedIn matches every post to a specific channel, such as health care, big data or public relations. The more focused your post is, the more likely it is to show up in the most relevant channel. To find success on LinkedIn, pick a specific niche you’re familiar with and write consistent, compelling content around topics in that niche. Do you know which channel your content reaches? Image: Shutterstock. However, not all topics are equally popular on LinkedIn. 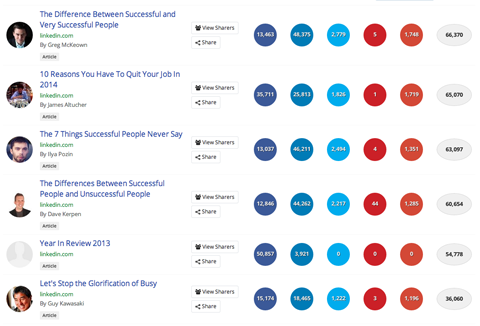 I analyzed 20,000 LinkedIn articles to see what the most popular articles have in common. I found that self-improvement topics like leadership, success, company culture and achieving greatness have more social shares, likes and views than articles about recipes or celebrities. That’s probably no surprise since LinkedIn is a professional social network. However, I found other niche topics unrelated to self-improvement that also received a lot of engagement on LinkedIn (average shares in parentheses): social media (1,138), productivity (1,125), storytelling (1,019), customer service (545), startups (490) and economy (431). The average LinkedIn shares by keyword or topic. As you would suspect, keywords have an impact on the success of an article as well. The chart above shows the most popular keywords included in well-received LinkedIn articles. The takeaway is pretty clear: Make sure your post improves someone’s life, either as an employee or as a leader in his or her industry. Creating relationships with well-known, respected people in your field has always been important. What better way to do that than connecting with influencers on LinkedIn? Networking, after all, is a big part of LinkedIn. To break the ice, ask several influencers to contribute a quote for an upcoming post, and then give them credit. When you publish the article, you’ll share it across your networks, of course. And it’s very likely that your influential contributors will as well. In his article 17 Things You Should Never Say to Your Boss, Dave Kerpen collected 17 quotes from prominent young bosses. The post generated over 940,000 page views and 19,000 LinkedIn shares. Much of the article’s success and engagement was likely due to the prominent influencers sharing the article with their employees and followers. If you’re looking to find influential LinkedIn publishers to partner with, try doing a domain search for “linkedin.com” in BuzzSumo. You’ll see a list of publishers who have written the most engaging content on LinkedIn. A list of the most influential LinkedIn publishers in the past year. Not every publisher is a fit, but networking is never a bad thing. If the person is not a fit now, he or she may be in the future. 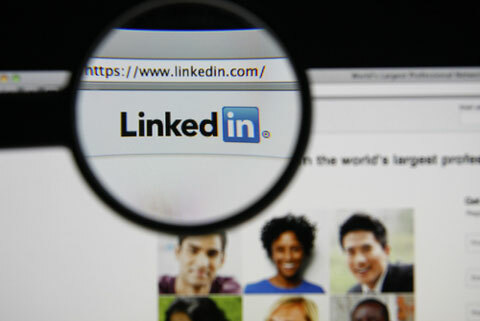 LinkedIn displays content based on metrics such as views, likes, comments and shares. The more interaction your article gets, the more prominently LinkedIn displays it. As you choose a topic, don’t be afraid to be controversial. The more controversial your topic or stance is, the more comments it’s likely to generate, especially from those who don’t agree with you. You can encourage even more engagement by ending your article with an open-ended question that invites readers to weigh in with their own experience, advice, questions or comments. End your content with a question to encourage comments. 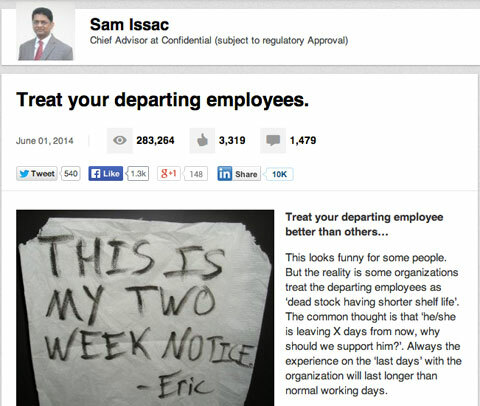 Sam Isaac’s article about how you should treat employees who leave a company ends with an invitation for readers to give their feedback. The article attracted over 1,400 comments within a week. Optimizing your headline is something you should always do, but it’s even more important when publishing on LinkedIn. Most LinkedIn users are very busy—they scan headlines and only click the most interesting ones. Which headlines work best? Those that promise a list or answer “why” are most effective on LinkedIn. List titles like the one below work especially well because they tell readers exactly what to expect from an article and pique the reader’s curiosity. In the example below the title catches a reader’s eye because Google is a popular company a lot of people want to work for. The reader may wonder what could possibly make someone avoid working for Google. To find out, they have to click through. This list article generated over 400K page views and 4,000+ LinkedIn shares. “Why” titles such as Job Interview: Why Only 3 Questions Matter or Why You Shouldn’t Say You’re Welcome are successful because they also arouse curiosity. You’ll notice that these titles introduce a little controversy too. Controversy not only encourages people to click through and read more, those readers are usually compelled to comment with their own point of view. In the end, publishing engaging content on LinkedIn is not much different than creating content for your blog, newsletter, Facebook fans or other social followers. The most important thing when publishing content to LinkedIn (or anywhere, really) is to zero in on a topic you’re familiar with and produce consistently useful content. What do you think? 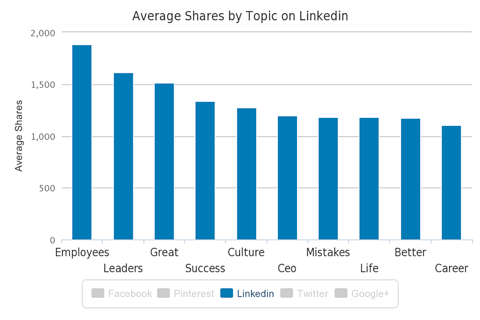 How do you optimize LinkedIn content for sharing? What kind of LinkedIn content makes you want to click through? Leave your comments and questions below. Henley is the founder of BuzzSumo, a content marketing tool that shows you what content resonates the most for any topic or competitor.